It was not until the late 1840's that Salina was reduced to its present size. The original Village of Salina stretched around Onondaga Lake, incorporating part of what is now the Town of Geddes and much of what today is the City of Syracuse. The early history of Salina is actually the history of the area around Onondaga Lake and the salt industry. By 1846, it was apparent that Syracuse would soon become a city. The townspeople of Salina and Syracuse began discussing a proposed charter, which would unify the two villages. In December 1847, the act of incorporation was passed, which defined the area as "constituting a part of the Town of Salina and incorporation the Village of Salina and Syracuse." This act reduced the Town of Salina to its present boundaries. 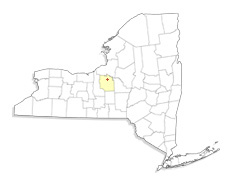 Today, Salina consists of five small suburban communities which are known as Mattydale, Liverpool, Lyncourt, Galeville and a portion of North Syracuse.